Although the landing area is very wide, the ideal drive is hit as close as possible to the two large fairway bunkers guarding the left side of the fairways. This will allow a straight shot into a very long green, with water to the right of and behind the green. "Safer" drives on the right side of the fairway will bring the water hazard guarding the green into play. The pin position on the huge (57 야드 wide) green can change his hole from a very benign par 3 to a devilishly difficult one. A large variation of tee positions also creates various distances of water carry. Similar in topography to the 캐년코스's signature 13th, this hole features an even more intimidating tee shot, which must carry a huge water filled canyon, or thread a narrow gap between the two canyons guarding this fairway. The green is also perched on the canyon edge, creating the need for very accurate and prudent approach play. A very wide fairway gives the golfer some strategic choice on the tee shot. The safer "high road" to the left leaves a longer second shot over another sheer-sided canyon. The shorter "low road" to the right flirts with the same canyon, but rewards a good drive with a shorter second shot. Following two left to right dog-leg holes, the fifth hole quickly tests the player who can't control his hook. Another precipitous canyon sits from the corner of the dog-leg to the side of the green. Your choice is to play safe with a long iron off the tee or to shape the ball around the canyon enabling a short iron approach. Over-hit second shots find a steep drop behind the green, further rewarding a courageous tee shot. Water greets errant tee shots on the left and the right side of this shortest downhill par 4. An interesting feature is the "Pine Valley" style short and long fairway "islands" separated by a waste area. The successful risk taker off the tee will be looking for a birdie. But a strongly sloping back to front green requires accurate approach play from the more conservative player. The most picturesque par 3 on the golf course. High teeing areas give a great view of this large green, beautifully framed by water and a bunker short and left and another bunker behind. Flowering Allemandes complete the backdrop. The green is subtly shaped to give very challenging tournament pin positions. The first of the par 5's. A straight forward drive gives the opportunity to "open up the shoulders". Only the longest hitters can consider taking on the waste area on the second shot to get home in two. Most will need a well placed second shot to avoid a large bunker at the left end of the dog-leg and a small stand of trees on the right. Three good shots will be needed for a birdie chance. Another par 5, but this time right to left all the way. The drive has a beautifully contoured landing area over water and framed by bunkers on the left. Long well-placed drives down the right side of the featuring will allow for a clear second shot over a rough valley. Only right to left second shots here will leave a short pitch to a raised green and a genuine birdie chance. One of the highest points on the course the teeing areas afford a lovely view of this short par 4, with the green tucked to the right in the rubber trees, protected behind by a sharp slope into water. A powerfully hit left to right drive may find the front of the green. If you don't get it right, your path to the green will be blocked & you may not find the green in two! A shorter accurate tee shot to the left over the rough hollow may be the smart choice. The shortest par 3 at the Blue Canyon. The green is virtually on an island, with water just short left and long right of the putting surface. Seeing a well struck short to medium iron from the elevated tee, out of a chute of trees, is one of the most enjoyable shots on the course. However, poor club selection could yield a 3-putt bogey or worse, on this large green. Normally a par 5 for regular play, today's professionals will find this a two shot hole. A large tree stands in the fairway's centre. Accurate drives will pass left of it leaving an easier second shot. Drives to the right leave a choice of a safe second or a long shot over water to a well-guarded green. This long uphill par 4 is becoming a very demanding tee shot as the trees mature. Drives must find the left half of a "hogback" fairway or they are kicked behind a Padauk tree guarding the right hand dog-leg. The second shot requires control of distance to a raised green, guarded from left by a cavernous bunker. Putts from "over safe" second shots behind the hole will be extremely fast. From the championship tee, this slightly left to right par 5 descends the full 22 meters of elevation change on the course. A wide fairway begs you to let rip from the tee; which you will have to do to be able to carry the water on the second shot. Beware, as there is also water close behind the green. This hole presents a definite birdie chance for a long hitter. This is the first and only hole with no water! However, the severe undulation of this par 3 more than compensates. 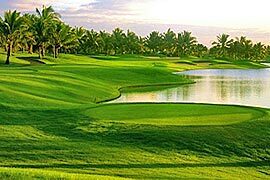 It is a refreshingly moderate par three in length, where good club selection and accurate execution will avoid very testing putting conditions. A single tree separates fairway options. The high left side allows a beautiful view of a small green slotted between high rust tinted canyon walls, step grassed mounds and a vegetation fringed water filled canyon. A single bunker provides "relief" for slightly pulled second shots. Over safe long second shots find rough slopes, awkward to chip from. There is nowhere to hide on one of golf's most testing holes.